Kensei Kobayashi’s group with the help of Takeo Kanaeko (a brilliant man) came up with another design where they named it Super Critical Water Flow Reactor (SCWFR) utilizing an infrared (IR) gold image furnace (Figure above). This enables the fluid in this system to heat up to 400 °C (or any desired temperature) within seconds (without pre-heating). This one specification is important as most autoclave and other flow reactors utilized an electrical heater which takes time to heat up to the desired temperature. This is undesirable as this “pre-heating” is also making the initial chemicals to react (or altered) to lower and rising temperature, which is not very realistic to a real vent. In other case, this is one of the slightly more realistic simulators i have worked to date. Kobayashi’s ex-student, Nazrul Islam performed the survivability experiment using several amino acids (aspartic acid, threonine, serine, sarcosine, glutamic acid, α-aminobutyric acid, β- alanine, γ-aminobutyric acid, 5-aminovaleric acid and 6- aminohexanoic acid), 10 mM each) by heating them up at four different temperatures (250, 300, 350 and 400°C ) at 25 MPa for 2 min (that’s pretty fast). They showed that amino acids tend to show better recovery when it is hydrolyzed, suggesting some kind of aggregation and/or condensation is happening within the system. Additionally they also showed oligomerization of glycine (100mM) with the same temperature. At 400°C, no oligomerization was found. However, at 200-350°C, diketopiperazine, diglycine, triglycine and tetraglycine were formed. It was suggested that the glycine reactions in a supercritical fluid (300°C to 400°C) are quite different from those in the liquid phase (at 200–350°C). There were many other peaks of unknown compounds in all of the chromatograms of the unhydrolyzed products. Most of those peaks disappeared after acid hydrolysis. This particular findings however remains a mystery. Another of Kensei’s sudent, Hironari Kurihara, used the SCWFR to test the stability of complex compounds produced from simulated primitive atmosphere (similar to Miller and Urey’s work). He then tested these compounds to assess the stability of some known amino acids. The complex-combined amino acids (from the primitive atmosphere simulation) preserved more amino acids (including amino acid precursors that give amino acids after acid hydrolysis) than free amino acids after heating in simulated SHS environments. In other words, these complex chemicals which could come from atmosphere (or space) could be better preserved if they are come into contact with the hot hydrothermal system which could have existed during the prebiotic-earth setting. This also hints that “clean or perfect” chemicals like amino acids used in many kinds of experiments are not necessarily showing the right picture when comes to chemical evolution on early earth. More on this in the future. 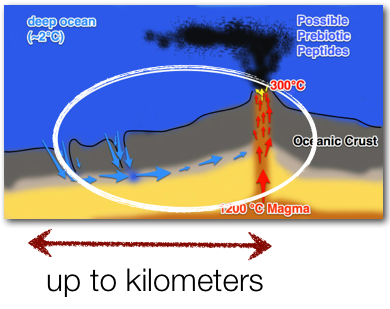 Many critics of hydrothermal vent simulators often argues that, simulators mentioned on this post and previous ones have a rather short flow-rate and short flow-length (showing low residence time, meaning how long the sample stays in the system). Critics usually cite studies that refer to residence time of fluids in axial hydrothermal environments range from years to decades, while those in lower temperature off-axis diffuse flow systems may be on the order of thousands of years. The problem with these studies about residential axial time of fluids is that, they’re are based on models and calculation only, no work has been done so far in regards to real time sampling or measuring the length of vent system (although, there are work in measuring the velocity of fluid emitting from a vent which looks promising for future measuring). Despite this limitation, i believe the future of simulators will be done using computer simulators, where experimental data from physical simulators (like the ones mentioned in this blog) could be used as parameters. The biggest advantage in this, is that, we do experiments on a larger scale which is could make the origin of life more complicated, interesting and not so straightforward, which I believe is a good problem to have in the future.